Open Data and Open Government initiatives have proven to spark innovation and growth in the private sector. Recently Open Data Aarhus released the Aarhus 3D City Model for the world to download. 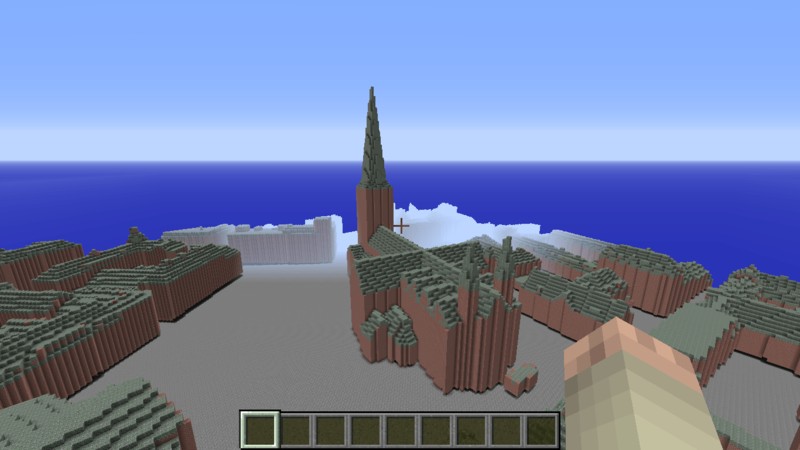 As a quick experiment GeoBoxers have rendered this model as a Minecraft world together with open data layers from the Danish Geodata Agency and the basic data program. The city model of Aarhus has been captured using traditional map-making methods from aerial images. The measurements behind the model has an accuracy of approximately 15 cm which is more than sufficient to obtain a satisfying result in Minecraft’s 1x1x1 m pixelated format. The data at hand is very detailed and contains even very small building parts such as chimneys and dormers. The model is available as an AutoCAD DXF file with sides of the buildings and roof structures separated in layers. All features are comprised of triangles and are separated in two layers. 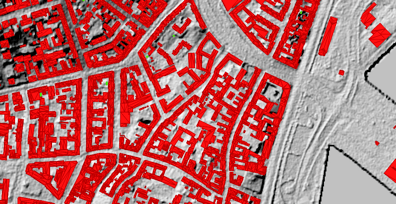 To supplement the city model we used the FOT vector data (ESRI shape files), and for the terrain we used the LiDAR point cloud (las format). Both datasets are available for download (links at the bottom). Buildings from the 3D city model on top of a terrain model. The result of our quick experiment with the city model of Aarhus looks pretty impressive, in our own humble opinion. The model was rendered using our own triangle renderer for Minecraft worlds. If you’re able to render triangles you can render pretty much everything. Triangles are great and always planar! Even the most complicated roof structures are nicely modelled using triangles. 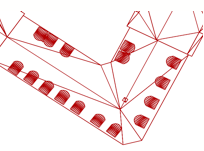 The DXF file was translated into ESRI shapefiles allowing us to attach attributes to the individual buildings. A small amount of code went into preparing the data, filtering and triangulating features with more vertices, typically rectangular 3D-features. When these initial steps were done the data was imported to a PostGIS database and attributes from the base map were transferred from the base map to the city model using standard SQL queries. We will expand on this topic in a separate article at a later time. 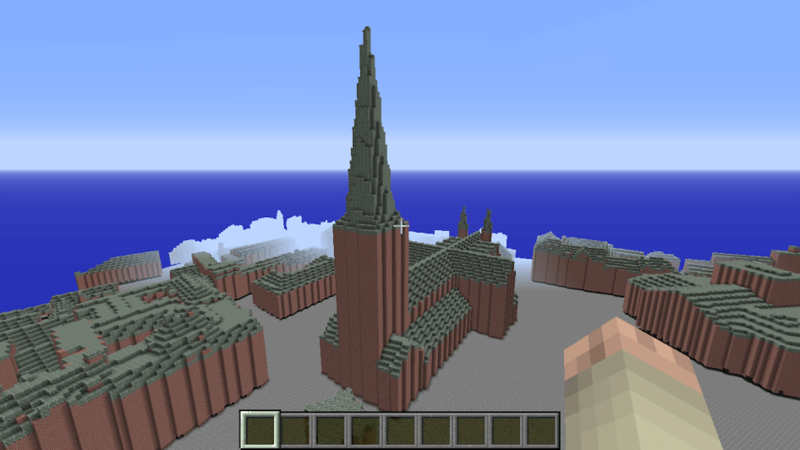 Looking at the resulting Minecraft world it is apparent that large buildings are more recognisable than smaller, more detailed structures. 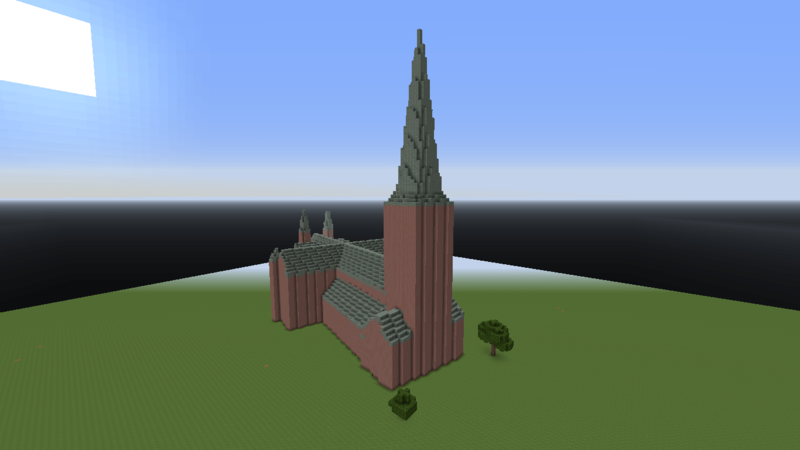 Especially buildings with simple, large surfaces, like the Cathedral of Aarhus, looks great and are well suited to the somewhat rough resolution in a Minecraft world at scale 1:1. This was just a quick experiment – there’s still a lot of room for improvement e.g. in matching building textures to Minecraft blocks and simplifying some of the more complex geometries. An overview of the entire model (click on the image to zoom). We have used data from the Danish Geodata Agency and Danish municipalities, DHM, FOT-data, August 2014, and data from the municipality of Aarhus, 3D city model, August 2014.